Gaming is about verbs. Doing words, as school teachers are fond of saying. When we play a game, we’re acting on, reacting to, interacting with as many things as possible. Player objectives are generally about getting from point A to point B, stopping someone else from getting to point B, finding object C, or evolving character-object-location X until it’s strong enough, big enough and important enough to Do Something. As such, games are not really about sleeping, having a quiet cup of coffee or sitting down. Not very often, at least. Sitting, then, is antithetical to gaming, despite the fact that players usually sit down to play. The aforementioned indulgences of sleep and coffee at least have practical analogues in gaming: drink coffee to gain speed (as in South Park: The Stick of Truth) or to keep your character awake (The Sims), sleep to recover health and diegetically pass fictional time – maybe even to show your avatar’s unspoken turmoil, like Wei Shen’s regular nightmares in Sleeping Dogs. In comparison, sitting is a pause in the action. Seemingly superfluous punctuation in a world mostly concerned with content over form. It is choosing to do nothing when there are plenty of things to do. That contradiction, that paradox of active inaction, actually presents an opportunity to game designers and players. Because sitting down is so far from what a game is and is for–at least, according to accepted wisdom–just putting a usable seat into a game is a message in and of itself. Nobody would question you for adding a knife to a video game, or a car, or even a fully simulated personal computer; these are play objects. But a chair you can actually sit on? That’s instantly foreign. Figuring out Gaming’s First Chair is tricky; it isn’t something people are likely to remember, or record. You could take bets on it being an RPG, for reasons we’ll go into shortly. For now, let’s look at the first time sitting down was seen as a notable, defining action: Ico. In Ico, the player is a horned boy leading a wispy girl through a fortress, fighting back shadowy demons and attempting some type of miraculous escape. When you save, rather than pulling up a non-diegetic menu or touching a nebulous glowing shape, the two young characters sit on a small stone sofa. As the boy sleeps, the girl touches his hand. It’s a wonderful scene, constructed from a perfunctory game mechanic. Making the characters sit down purposely halts the action in an immersive and welcoming way–distinct from the necessary, but jarring, intrusion of your average save function–and allows both the player and the characters to rest. Ico is all about running, exploring, leaping from place to place, pushing and pulling on objects and people; moments on the couch provide an alternative, they invite deliberation over the content that precedes and follows them. Running, jumping and fighting defines the content of the experience, while sitting defines the consumption of both. Role-playing games have a more simulation-focused approach to sitting down. RPGs are, by their nature, about constructing and interacting with a facsimile of one world or another. They seek to reproduce the feeling of being part of a fictional universe by simulating aspects of it–as many as are necessary to create the illusion of reality. So you walk from place to place because you need to feel that there is real distance between locations, you buy and sell items because you need to experience a functioning economy and feel that it is logically part of your personal progress. And so it follows that you sit in a chair because, well, that’s what chairs do. From an RPG design perspective, it can be an unacceptable deficiency to have a seat present in the game which cannot be sat on. Checkhov’s chair, if you will. This approach is perfectly valid from a simulation perspective, but falls a little short when it comes to providing meaning or context. It fills the world, but fails to enrich it; fast food for your virtual buttocks. Such flippant use of seating even has the potential to tug at the very reality on which the chair itself sits. Consider an early moment in Skyrim, after your escape from the dragon at Helgen. If you choose to follow Hadvar, the Imperial soldier, you eventually end up at his uncle’s house. The NPCs sit down around the uncle’s dinner table to discuss the severity of this whole “dragons are scary” situation, and you stand around awkwardly. Or perhaps you sit down, awkwardly. Regardless of which side you choose in the Uncle’s Chair quest, nobody really cares. The game continues on exactly as it would have, you learn nothing new and gain no new perspective on the situation, the characters, the environment or the game experience. Worse still, the precise depths of Skyrim‘s universe have inadvertently been plumbed; if a chair is simply an object to be used or not used, for no apparent benefit, perhaps the same is true of everything else. Subconsciously, players are primed to look beyond the simplistic functions of the world and see the cold, unfeeling switches that control them. These things aren’t all or nothing, however, particularly in sprawling, hundred-hour epics. Not much further into the same game, it’s possible to discover that sitting down at a table in certain establishments will encourage a server to come and take your drink order. This at least acknowledges you made a physical choice in the game, and, in turn, adds to the immersion, although the results are still purely mechanical. A lack of connection (I hesitate to say “disconnect”, as it implies an unnecessary necessity) between systemic action and metaphoric meaning in this regard isn’t confined to role-playing. Assassin’s Creed often lets you rest easy on a nearby bench to hide from the authorities or eavesdrop on a nearby conversation. Even though this has a gameplay purpose, it clashes with the overall direction of the game itself, which emphasises dynamic movement and combat. Sitting down still effectively pauses the action, but for no net gain to the player’s experience. You just sit for a while, then get back to the task at hand. Compare this to the act of sitting in Brothers: A Tale of Two Sons, where benches are also plentiful and players are subtly but firmly encouraged to use them. Sitting down here hearkens back to the simple solitude of Ico; the brothers–and, importantly, both must sit to make the experience worthwhile–rest on one of the game’s many seats and are treated to a sprawling vista. This view of where the two boys are going, or have gone, serves a couple of purposes. First, it lets players stop and reflect, on the journey, on their actions, on the game itself. It puts optional space between the increasingly trying events of the boys’ quest to save their father. Second, the moments of rest provide visual feedback about gameplay, environments and narrative to come, as well as what is being left behind. 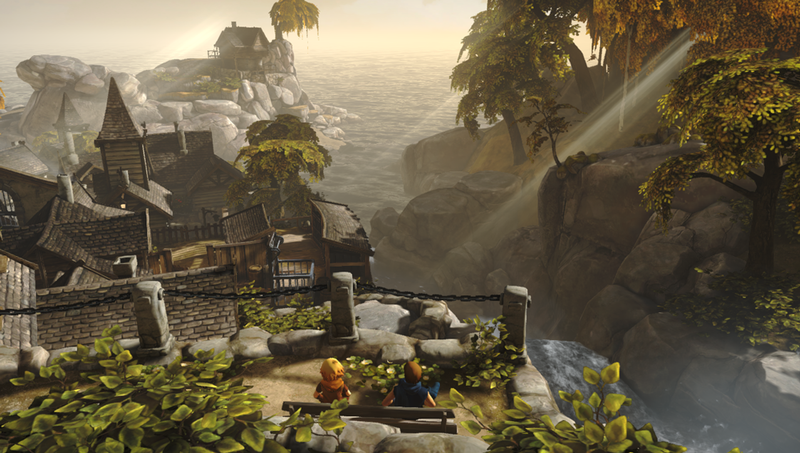 The seat pictured above shows the brothers’ family home in the background, simple and distant, as the coming of age journey begins in earnest. Conversely, sitting in one area much later causes the camera to rise up and tilt downwards, revealing a sinister shrine at the base of a waterfall tainted by the blood of a giant war. These moments are quiet and thoughtful, but never divorced from the mechanics or gravitas of the task ahead of you. Despite being passive instances, they remain part of the game as a whole. Brothers even uses the player’s knowledge and expectations of video game sitting to pull their strings. When you first realise you can sit down, the likely reaction is one of pleasant satisfaction. It comes across as a nice touch, a welcome diegetic gimmick which lets you appreciate what is a very beautiful game world. This aesthetic purpose is so convincing that you almost don’t notice when it begins to turn into something more sinister; by the time the game concludes, these seats are melancholy reminders of a troubled, broken world. They are also, in retrospect, a memorial to things lost–a realisation which will sting anyone that finished the game. But it doesn’t always need to be some complex symbolic representation of growth and decay personified by the transition from childhood to adulthood. 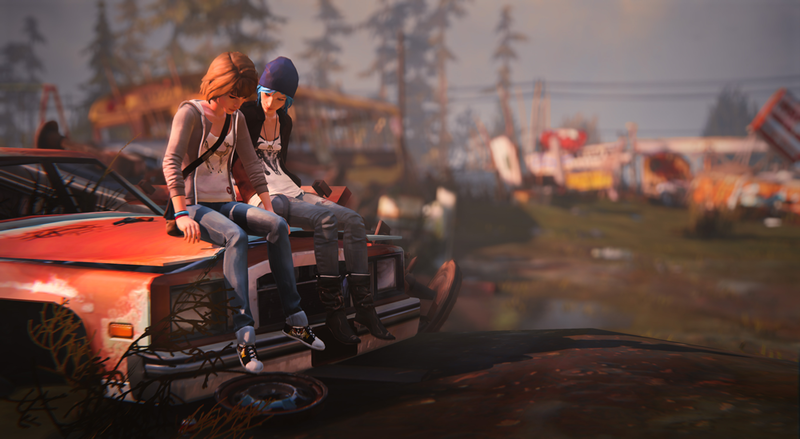 Life is Strange uses sitting as a way to provide depth, characterisation and insight without resorting to clumsy, “video game” solutions. Max Caulfield is often given the chance to sit (or lie down) and reflect on the tangled space-time teenage drama that is her horrible life. Sitting usually triggers a small inner monologue detailing Max’s thoughts and questions about recent events, giving us as players access to opinions that could otherwise only be guessed at or inferred from public actions. It makes perfect sense to do it this way, too. Max is a teenage girl, bursting with awkward, directionless angst, burdened by a tendency to overthink everything, and genetically predisposed to be a time-wasting lump of pure selfishness. Sitting on a swing set and thinking about how, like, totally hella weird it is that her friend’s stepdad is a jerk while time itself literally collapses around her is exactly what you’d expect from a teenager. It even contextualises the otherwise surprisingly vague game title; you can easily imagine one of the characters listlessly staring into the distance while sitting on a bench and mumbling “Boy, life is strange.” When Max decides, through us, to sit and think for a few moments, it lets us step back and feel that she’s a real person in the middle of a terrible mess, not simply a girl-shaped avatar we can lead from scene to scene. Crucially, players also decide when these sitting moments end, whether Max gets up after a few seconds or stays there indefinitely, we are the architects of the moments. Which, incidentally, ties in pretty well with the time travel theme as well. Infinite time to sit and think. Way up the top, I mentioned the idea of sitting as punctuation for the dynamic, action-focused world of video games, and I think that’s both true and a very positive concept. 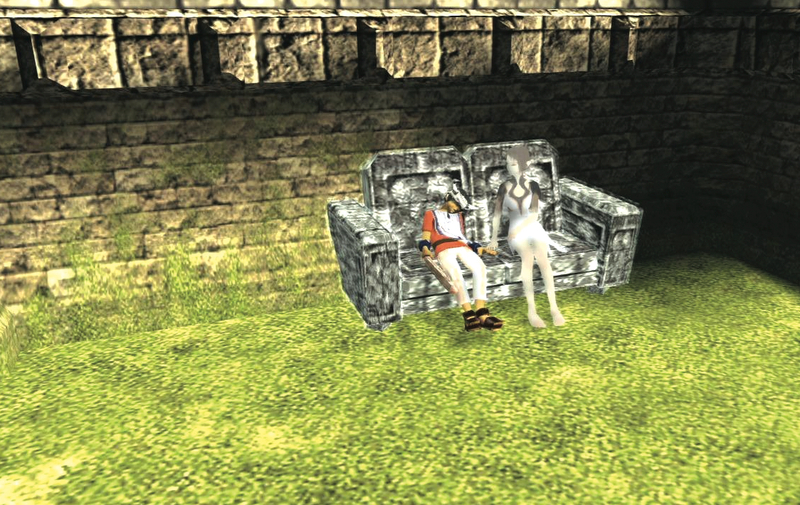 Sitting down in Brothers or Ico is useful in that it provides a physical space within the game world for an examination of that same world. It allows us to make meaningful sentences of the jumble of exciting words that games hand us from level to level. It’s certainly not the only way games can invite players to reflect on their content, but it manages to be notable because of its very nature as an opposite to most types of interaction. Consider also that it’s only in an interactive medium like video games where the concept of “doing nothing” has any meaning in the first place.